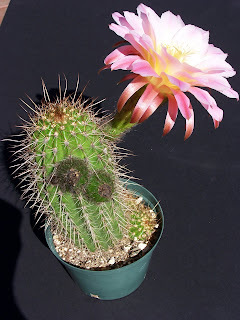 One more photo for tonight: Rebutia narvaecense. It's been blooming for the last couple of weeks. Just another image of the flower from the last post. We woke up this morning to be greeted with this fantastic flower. It's just been way too busy since returning from our trip, but the flowers just keep coming anyway. And with the temperature rising to 88 F today, there are flowers everywhere! 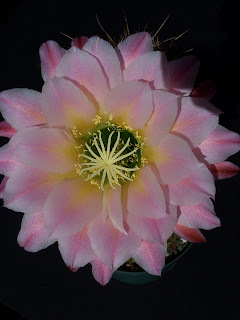 This is the flower of Echinocereus rigidissimus subsp. rubispinus. There are several of these flowering. We got a bit sick on our trip so we cut it a bit short. But nothing can stop us from a couple of side trips out to some desert cacti. Just the right time of year for the Beaver Tail cacti to be in bloom. I took this photo just before we left on our trip but didn't have time to upload it. It flowers reliably every year and makes a handsome display.